While social is an evolving medium, the social media space in India is seeing an increase in integrated campaigns that are weaving in relevant social media platforms, that go beyond leveraging only Facebook and Twitter. After witnessing a cool set of social media campaigns in 2012, the first quarter of this year has been an exciting one with brands from all sectors using multiple social media platforms to drive home the message. Here, we have compiled a list of best 18 social media campaigns that are in no ranking order, for the first Quarter of 2013. These campaigns have been creative as well as aligned to the objective. The new Sony Xperia Z launched this March, created quite a stir on social media with Katrina Kaif, the brand’s new face. Along with a dedicated microsite, Twitter buzz around #BestofSony and a Sony Xperia Z playlist on its official YouTube channel, the brand had also created an augmented reality based Facebook application titled ‘Katrina and You’. The app enabled fans to visit the places shown on a map with Katrina in a poster. Her virtual image explained the features of Xperia Z and fans also got an opportunity to have their pictures clicked beside her image. Read the entire campaign here. 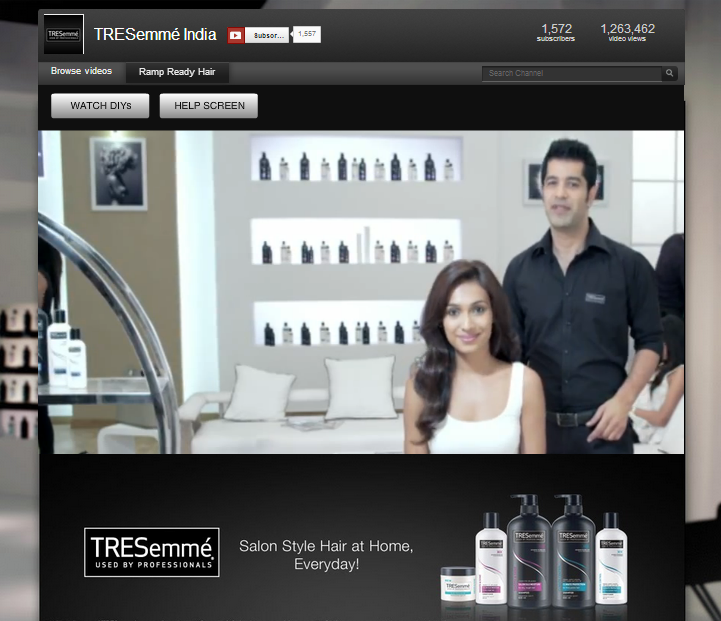 TRESemmé from FMCG major HUL leveraged social media to strengthen its premium hair care offering. The brand had launched an interactive salon through its YouTube channel hosted by actress and brand ambassador Diana Penty. The virtual salon featured do-it-yourself videos that took a step-by-step approach for the ramp ready hairstyles selected by a user. It also partnered with Indiblogger, a community of Indian bloggers to host a blogging contest where bloggers had to choose a hair style from the YouTube channel, try it and blog about their experiences. Read the entire campaign here. In an area like insurance where brand loyalty is largely dependent on trust, Aviva Life Insurance has been focusing on the bond between a father and child to create active communities of responsible parents. 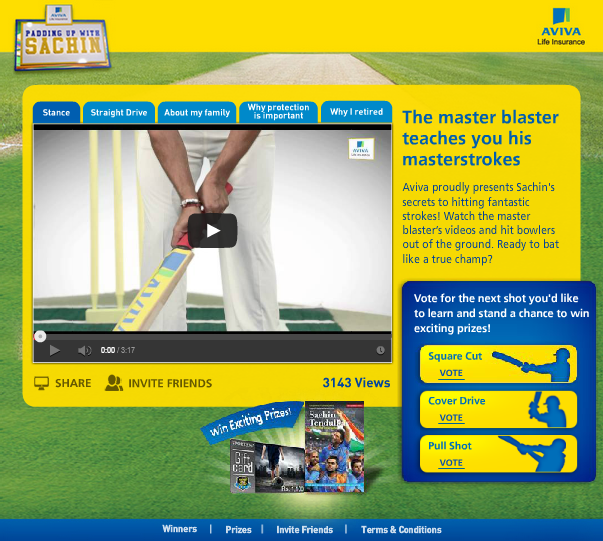 Aviva India along with its brand ambassador and cricketer Sachin Tendulkar, created the ‘Padding up with Sachin’ experience using a combination of Facebook and YouTube. Padding up with Sachin had him teach batting styles in the form of video tutorials and featured interviews where he talks about his family, protection in cricket, etc. Read the entire campaign here. To promote the new Nestlé Munch 4X4, Nestlé India roped in cricketer Virat Kohli as the new face of the brand. However, Virat plays the character of Balakrishnan Vaali who is a regular Chennai guy with affection for coffee and the chocolate. A social media profile was created for Vaali on Facebook as well as Twitter complete with believable details and regular Chennai taste. Vaali connects, communicates and entertains the community besides talking about Munch. Read the entire campaign here. 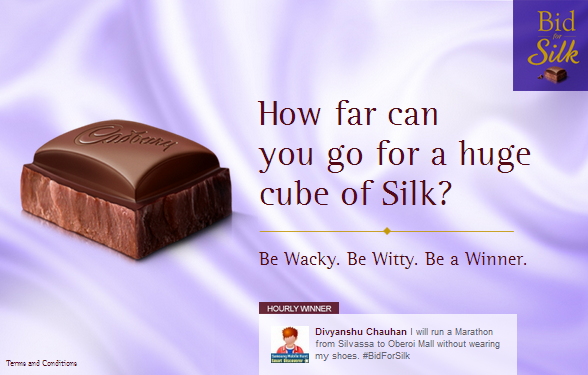 When Cadbury Silk came out with its latest version, the brand did a series of social media activations that were both fun and interactive. Beginning with announcing the imminent demise of Silk, the channels managed to successfully create the right amount of curiosity. And while fans were mourning and sending their farewell wishes, the page brought alive the new Silk for the heartbroken fans. Besides, the brand challenged Silk fans to bid for giant cubes of Silk weighing 14 kilograms each at a mall in Mumbai, by claiming what they would sacrifice to take those cubes home. With a Facebook app and a hashtag on Twitter, ‘Bid for Silk’ drove curiosity for the new version. Read the entire campaign here. 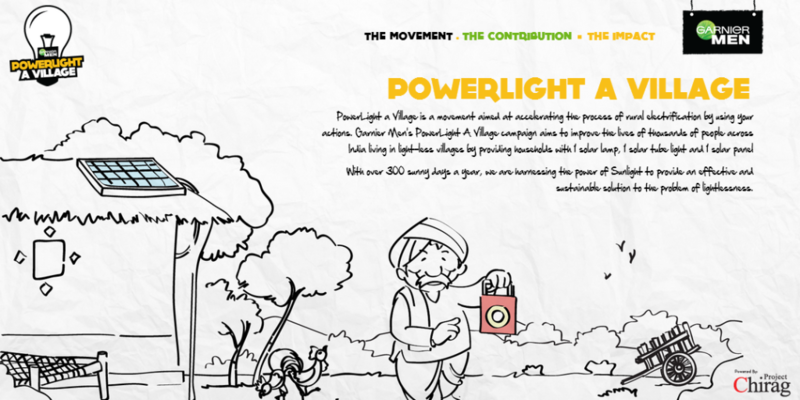 Garnier Men India collaborated with Project Chirag for a unique social campaign ‘Powerlight a Village’ – providing solar electrification system to villages without electricity. ‘Powerlight a Village’ asked fans to pledge their support through social media. Every like, share and comment would contribute a predetermined unit of energy. This would also be coupled with on-ground activations where men could pedal bicycles which will record the energy generated. A summation of all these activities would eventually be translated into actual energy donation through solar equipment. Read the entire campaign here. 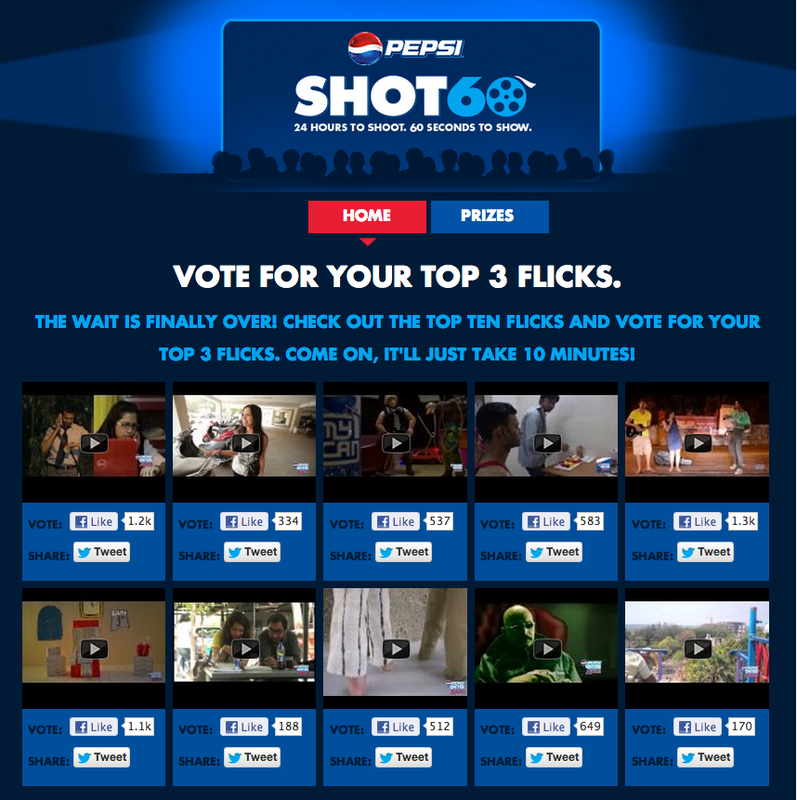 Going by the ‘impulsive, impatient’ attributes of the youth today, Pepsi India went in for a new positioning with ‘Oh! Yes Abhi’ in line with its global repositioning as ‘Live for now’. Along with an ad film, the brand initiated “Pepsi Shot 60″ – 24 hours to prepare a script, shoot the video, edit and submit it online and “Music Abhi” – an on-demand digital live concert, integrating Pepsi’s social media platforms and exciting incentives. Read the entire campaign here. When the beauty brand known for its campaigns around real women, Dove needed to introduce its new shampoo that reduces split-ends, it launched a series of campaigns on social media that played around the concept of split ends. Dove reached out to bloggers through a blogging contest, where they were invited to share stories about beautiful ends to their beautiful braids. 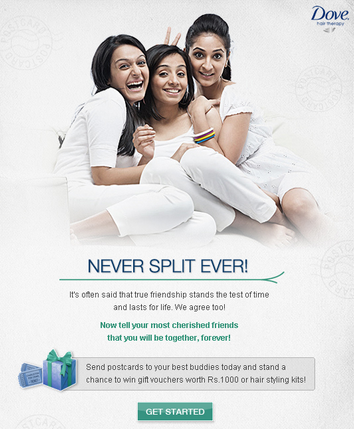 On Facebook, an interesting application called ‘Never split ever’ enabled users to send postcards to their friends, and win exciting prizes. Read the entire campaign here. Sony PIX had devised a cool social media campaign around an ‘Anti Alien Day’ created for the promotions of its Men in Black 3 premiere. 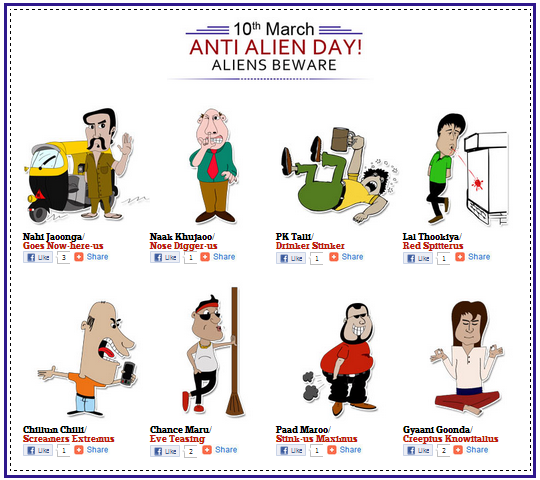 An interactive Facebook application that celebrated March 10 (the day of the premiere) as Anti Alien Day, enabled viewers to identify the aliens in their society, where aliens were a metaphor for the various evils plaguing society. On Twitter, one could also ‘spot the alien’ in MIB3 hoardings, upload the image on Twitter and win prizes for the most twitpics. In addition, Sony PIX partnered with Twitter to create real time conversations during the premiere. Read the entire campaign here. Post an extensive experimental campaign that involved bloggers and the Facebook community to find wild ways to straighten hair, Sunsilk launched its new hair product that keeps hair straight. The product launch for ‘Perfect Straight’ was aided through an interactive page on YouTube to demonstrate the efficacy of the product through relevant video stories, and a blogging contest, where bloggers could avail a free sample and blog about their experiences. Read the entire campaign here. The heist Bollywood hit, Special 26 by Viacom 18 Motion Pictures, created a formidable social media presence prior to the launch. With simple apps on Facebook that aligned with the story like ‘Which type of con artist are you’ and ‘Akshay’s Special 26’, the movie managed to drive engagement through Facebook. Interestingly, fans could watch an exclusive trailer on a Facebook app only after sharing it on Twitter. On Twitter, fans were asked what Akshay could sing for them, as he had sung one of the songs in the movie, amongst other activities on Twitter. Read the entire campaign here. Earlier this year, biscuit major Parle G came up with an exciting campaign around the concept that every child is a genius as long as it stays curious. Parents had been urged to not kill their child’s curiosity through a series of messages using Facebook and Twitter before launching the new ad film and introducing the website ‘The Future Genius’. Twitter contests aimed at parents like #IfIWereAParent and #BeCurious invited them to tweet curious, imaginative questions asked by their kids. Read the entire campaign here. 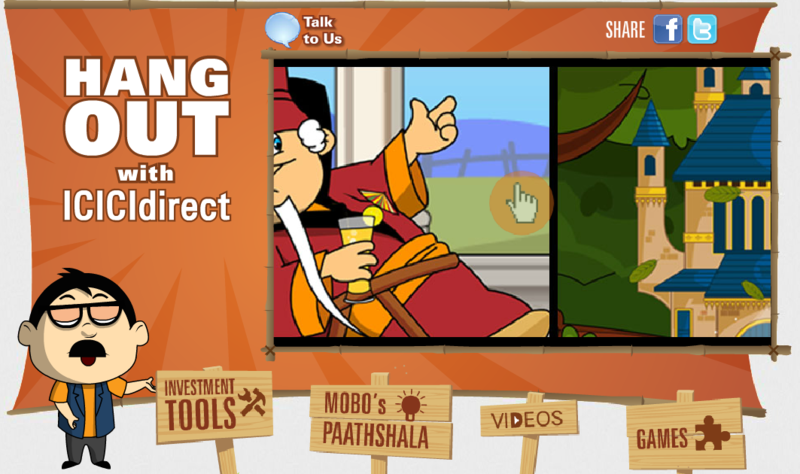 For its portal ICICI Direct, ICICI Securities decided to make financial planning a fun thing to learn through social media storytelling. Two animated characters – Gyano, the magician and Mobo, the money boss were created to explain how shortcuts ended up nowhere whereas proper financial planning led to a peaceful life. While one could hangout with the animated characters on YouTube, the brand integrated Facebook for further action like providing customised investment solutions or videos explaining financial jargon. Read the entire campaign here. 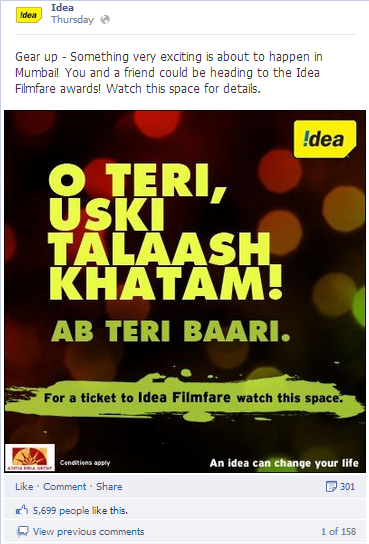 This year the 58th Filmfare awards sponsored by telecom brand, Idea created a cool campaign ‘#TicketToIdeaFilmfare’ that gave fans an opportunity to earn themselves free passes and feel the glitter of the red carpet. The campaign was executed as a treasure hunt game, where the tickets were hidden in four different places in the city, while Facebook and Twitter were used to provide the clues. Interestingly, the clues related to Bollywood requiring fans to have a fair knowledge of it. Read the entire campaign here. 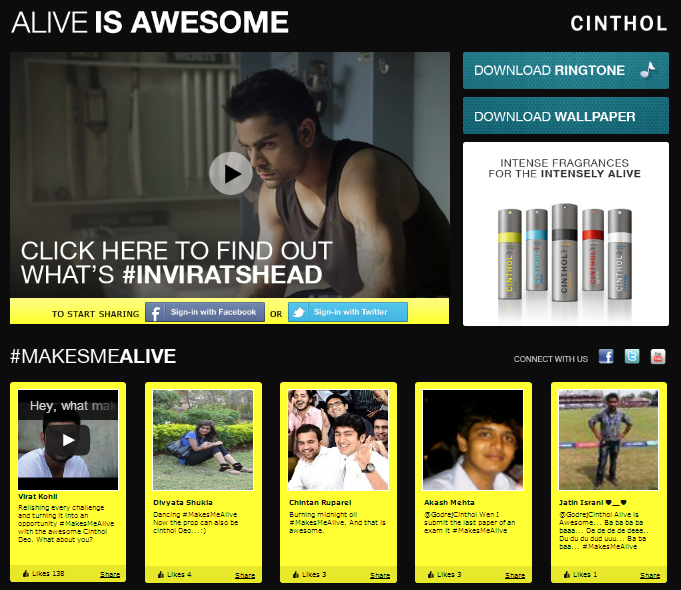 The teaser campaign to launch Cinthol’s latest deo range was an integrated one that saw a microsite being simultaneously integrated with Cinthol’s social media presence and had also synched cricketer and brand ambassador, Virat Kohil’s social media presence. A video on the microsite featured a pensive Virat before a match, who asked fans to guess what was going on in his mind. Users had to logon to the microsite and guess the reason either through Facebook or Twitter, and Virat also created video responses for some of them. Read the entire campaign here. When eBay India completed 8 years this March, the online marketplace celebrated with the ‘Way Too Fab’ campaign that leveraged Facebook and Twitter, while also boosting sales through discounts, offers and flash sales aided through social media. From a screaming contest on Facebook to Twitter contests like #ReasonsToParty and #8YearsBack, the brand played around with the number 8 and celebrations. Read the entire campaign here. 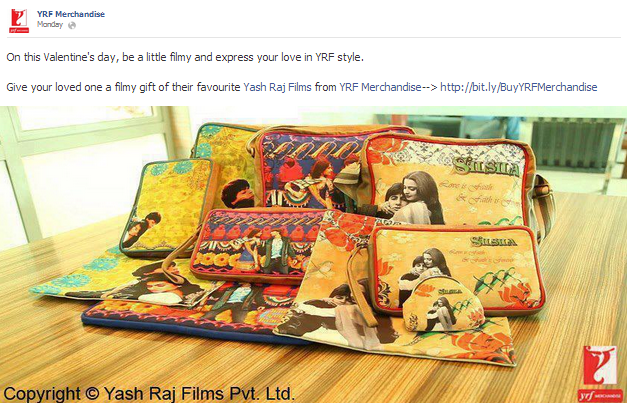 This Valentine, YRF Merchandise, the brand that thrives on the goodies based on the romantic movies by its sister concern Yash Raj Films, had designed little contests on each of its social media platforms to help promote its merchandise. With gift vouchers for Facebook fans for sharing content to #SpreadTheLove contest on Twitter, where one had to retweet and mention someone they wanted to dedicate the featured YRF merchandise, to a ‘Pin it to win it’ contest on Pinterest having the same concept, YRF merchandise leveraged the season of love on social media. Read the entire campaign here. Gossip Girl – the American teen drama series -that thrives on the story of teens and gossip, recreated the fun of gossip on Facebook to promote its upcoming 5th and 6th season on English entertainment channel, Zee Café. A Facebook app called ‘What’s the gossip’ enabled fans to know the scandalous secrets of their Facebook friends which they could then share with the network to spread it. The show also arranged exclusive Gossip Girl tweet-ups and contests on Twitter, prior to the show. Read the entire campaign here. We have tried our best to bring out the most interesting efforts on social media beginning this year. In case, you are aware of other social media campaigns that deserve a mention in this list, then do share them with us in the comments. Also, don’t forget to tell us which is your favourite social media campaign and why?